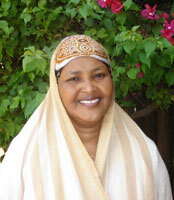 Nuria Abdullahi Abdi from Wajir, Kenya has been chosen as the ninth recipient of the Senesh Fellowship for 2006-2007. She is presently working on a Master’s degree in Conflict Transformation and Peace Building at Eastern Mennonite University. Her major area of interest is in Strategic Peace Building and Non-Violence. She has a Certificate in Animal Health from the Animal Health and Industry Training Institute in Nairobi, Kenya, a Certificate in Meat Hygiene from Nairobi University, a Certificate in Professional Development Studies from Birmingham University in the United Kingdom, and a Diploma in Disaster Management from the Kenya Institute of Social Work and Community Development College in Nairobi. Her current research is in the area of the role of women and youth in conflict transformation and peace building; she is hoping to overcome the prejudice and stereotypes and influence the negative cultural norms and perceptions that hamper their participation. She feels that it is important to harness the input of women and youth and integrate them into the peace building processes. Ms. Abdi’s prior work has included working with the government of Kenya as an field extension worker in the veterinary department; working as a community development and gender mainstreaming trainer; as a trainer in peace building, conflict management and conflict early warning and response mechanisms; and as a social worker. She is one of the founding members of Wajir Women for Peace, has experience in pastoral conflict, has coordinated the peace building activities in the Wajir district of Kenya for the last seven years, and has been involved and engaged in dialogue and mediation processes in the Northern Region of Kenya.